The East Greenbush Physical Education program promotes the maximum physical, emotional and social growth of every child in the East Greenbush Central School District. 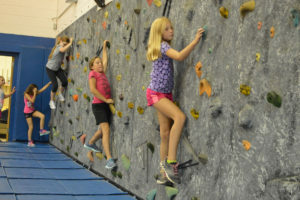 The Physical Education curriculum is aligned with the New York State Standards and provides all students with a broad range of physical activities to foster healthy habits and positive decision making skills. The Physical Education program will work with the students to deliver and instill the knowledge necessary for a lifetime of health and fitness. Columbia students participate in physical education for one period (45 minutes) every other day. Units include team sports, individual sports and body conditioning. Students earn .5 credits each school year and must have 2.0 credits to graduate. More information. Goff students participate in physical education every other day for one period (40 minutes). Units include team sports, cross country running, dancing and fitness. More information. Elementary students in grades K-5 have physical education every other day for 40 minutes. All students must be prepared for physical activity and exercise by wearing appropriate loose fitting clothing (athletic shorts, sweatpants, wind pants, long sleeve t-shirt, t-shirt, etc.) and rubber sole sneakers. Students should not wear jeans, dresses, skirts, tank tops or dress clothes.